The purpose of this design is to create an antenna for mountains. The antenna must correspond follow requirements: To have gain not less the 7-dB. 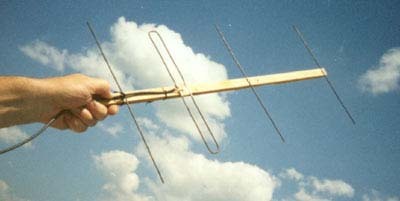 Forward Gain is the main characteristic of the antenna. A wide lobe must be. During a QSO you can hold the antenna by the tail and shaking of the antenna should not result to full 'failure' of the communication. Simplicity in making and adjustments. An opportunity of fast repair in field conditions. Antenna weight with coaxial cable both must be up to 500 gram. 50-Ohm coax for the feeding must be used.